The problem: we can't join both columns using the same relationship. 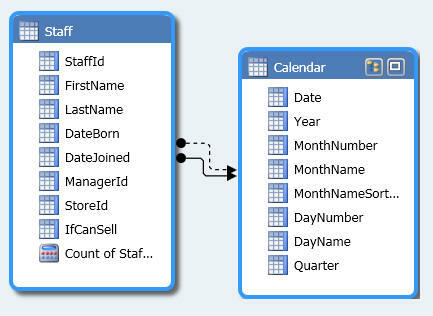 One answer - shown in the previous part of this blog - is to import a second copy of the calendar table. The other possible answer is to create two different relationships, and then specify within each measure which one we're using. Please first follow the steps in the previous part of this blog to recreate the model containing the two tables shown above (including expanding the calendar table to go back to 1st January 1950). 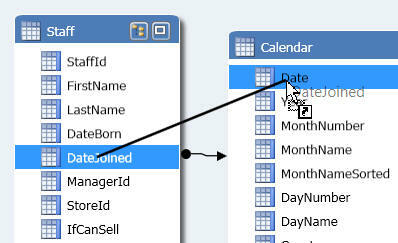 Drag the DateBorn column (for example) onto the calendar Date column. 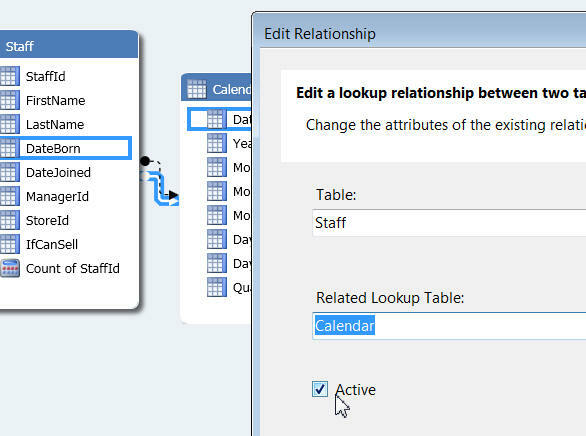 Create a second relationship, this time using the staff joining date, not the birth date. The one with the solid line is the active relationship. Double-clicking on the solid line shows that this is the active relationship. The CALCULATE function returns a value, whereas the CALCULATETABLE one returns a table of values. 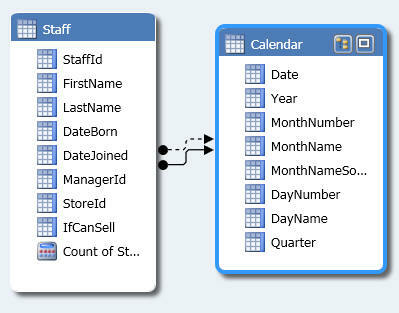 Where two or more relationships exist between a pair of tables, Analysis Services will use the one marked as active to connect them. 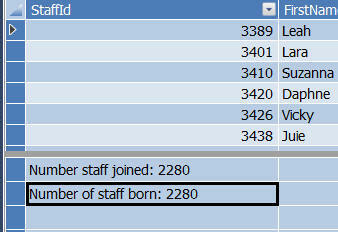 Create the two measures shown in the staff table, using the formulae below. The only difference is the relationship they use to pick up on any calendar constraints from the calendar table. Again, the only tweak I've made is to sort the years into reverse order. I've just asked to show the two measures created. Personally, I much prefer the previous approach! 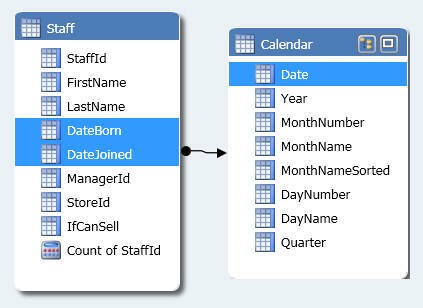 I'd rather have multiple tables (each having a separate relationships) than have multiple relationships to the same single table.